She's Sew Crafty: It's Birthday Time! Hello!! It's been a long time since I've blogged and I am so happy to be back with a card to share. I went out of my comfort zone and tried a style I have been admiring lately. 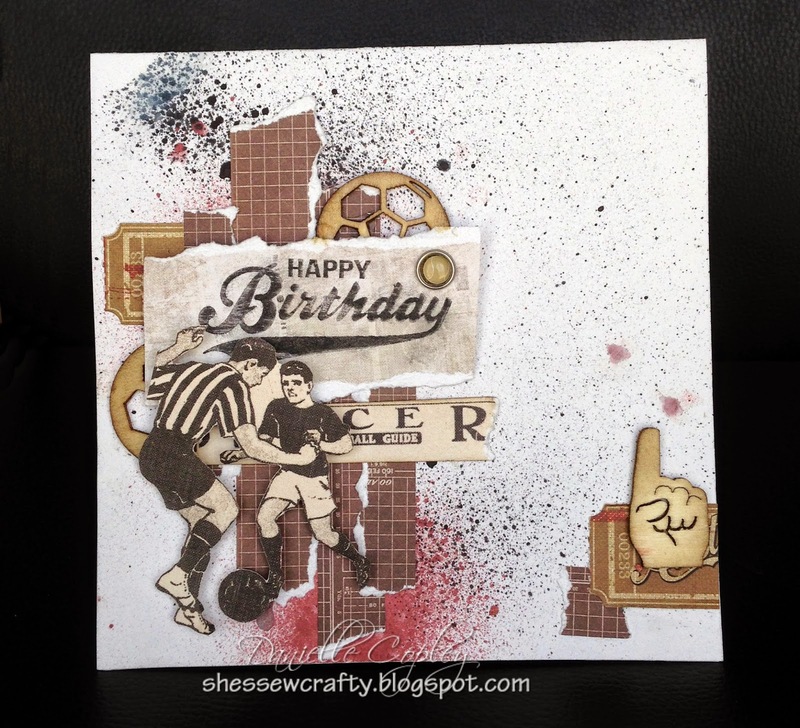 I made it for a soccer loving birthday boy. I hope he likes it! I'm still trying to decide if I like it :-/ I have used Prima's Allstar 6x6. It's great paper for the sports players in your life. I have also used the coordinating wood icons and brads. Oh, and a ticket from the Tickets and Tags. I fussy cut the soccer players from the paper to give the card more soccer vibes. Yes, I went a little crazy with the mists. Still trying to figure out the pressure and distance needed. I was wondering where you'd disappeared to, you have been missed. This is a very different style for you, still undecided too. But it's always good to try new styles. Thanks, Amandah! Yes, not sure still, but I hope you'll like my mini albums I'll be posting better, lol! Thank you, Dortesjs! I'm still practicing with this style!